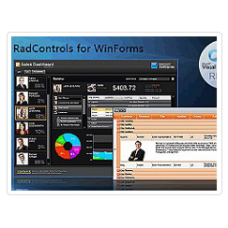 Comprehensive toolbox of 110+ WinForms UI controls to help you develop everything. Easy development of complex, high-performance apps for Desktop and Tablets. Get started immediately and enjoy an intuitive experience from day one. Touch enabled Windows Forms for tomorrow-ready applications. Create flexible grid layouts, effortlessly. Easily maintainable controls within any test-driven development process. Convert your apps to Telerik UI for WinForms in just a few steps with an easy-to-use wizard.